Johnson Building Services offers a comprehensive carpentry and building service to meet all requirements for maintenance and improvements to your home. From minor repairs to extensions and renovations, we provide a professional and reliable service to the highest of standards. Regardless of the size or nature of the project, we provide advice, planning and management, from design to completion. As a smaller company our reputation is very important to us, with much of our work coming from customer recommendations. We are members of several trade organisations; Checkatrade, the Federation of Master Builders, TrustMark and Trading Standards Buy With Confidence and all of our work is continually monitored through customer feedback reports. We have been thoroughly vetted by these schemes to ensure we are a reputable company that operates in a fair, honest and legal way. As members of the FMB, our work has been independently checked to ensure all work is carried out to a high standard. We pride ourselves on the quality of workmanship and guarantee all of our work to ensure customer satisfaction, we offer all of our customers deposit protection insurance and insurance backed guarantees through the GGFi. JBS has over 20 years experience within the construction industry and uses only experienced and qualified tradesmen. Johnson Building Services specialise in carpentry and kitchen and bathroom design and installation, although we offer a wide range of services to cover all aspects of home maintenance and improvement. Johnson Building Services is based in Gosport and undertakes work throughout Hampshire and the surrounding counties, covering areas such as Gosport, Lee-on-Solent, Titchfield, Fareham, Locks Heath, Park Gate, Hill Head, Whiteley, Portchester, Portsmouth,Waterlooville, Cowplain, Emsworth and the surrounding areas. Contact us now to arrange an appointment or submit an enquiry and we will call you back. At Johnson Building Services we provide our customers with deposit protection insurance and an Insurance Backed Guarantee through the GGFi. In addition to our Written Guarantee, this extra protection gives our customers peace of mind that their investment is secure and any guarantee provided by JBS will be honoured for the complete duration period specified. 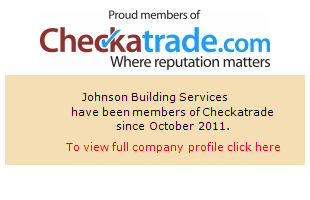 Download our Checkatrade Report to find out more information about Johnson Building Services. View the 25 most recent reports and read what our customers have to say about Johnson Building Services. You will need a PDF reader to be able to view the Checkatrade report. You can download Adobe Reader here. View some of the recent work carried out by Johnson Building Services. Visit our photo gallery and references sections to read what our our customers have to say and view their recommendations. Read feedback from customers throughout Hampshire, in areas such as Gosport, Fareham, Stubbington, Lee-on-the-Solent, Titchfield, Portsmouth, Waterlooville and Southampton. Connect with Johnson Building Services online to keep up to date with our latest offers and information. Like us on Facebook to receive regular updates, read our latest customer feedback and view our most recent photographs. Interact with JBS by posting any comments or questions on our social media pages and we will respond to you as soon as possible.